Steve had been expecting us in Townsville for a couple of weeks, although he was a bit unsure of the exact date we would show up. Nina contacted him through Couchsurfing whilst we were in Indonesia and we somehow managed to arrive on the proposed date. Steve worked in the mining industry as did so many of the people we met “along the track”. He also seemed to be a professional couchsurf host having welcomed over 200 people into his apartment in the last 12 months. 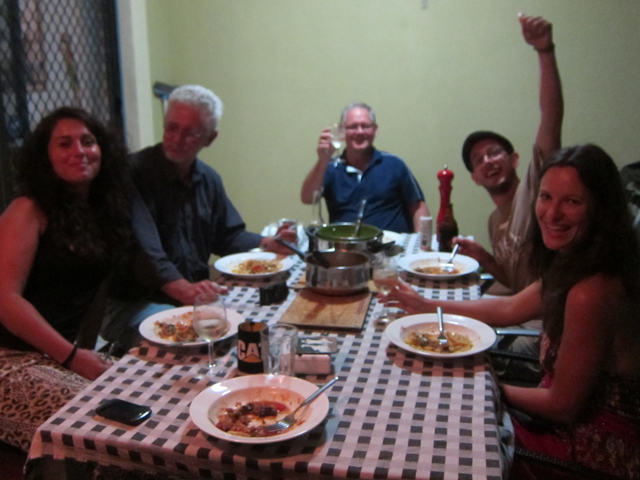 Nina and I had a well earned shower and joined Steve and two other couchsurfers, Anna and Pauline, for our first square meal in days. The following day Steve went off to work and Nina and I explored Townsville’s Botanical Gardens, traditional brewery and seafront walks before we cooked for the crew, this time joined by Steve’s brother Kevin. It was a great introduction to the east coast and after a couple of drinks we even had the brothers reciting patriotic poems and songs of Australia! The next morning Steve gave us a little tour of Townsville and a view over the city from Castle Hill before dropping us at a suitable hitching point just out of town. 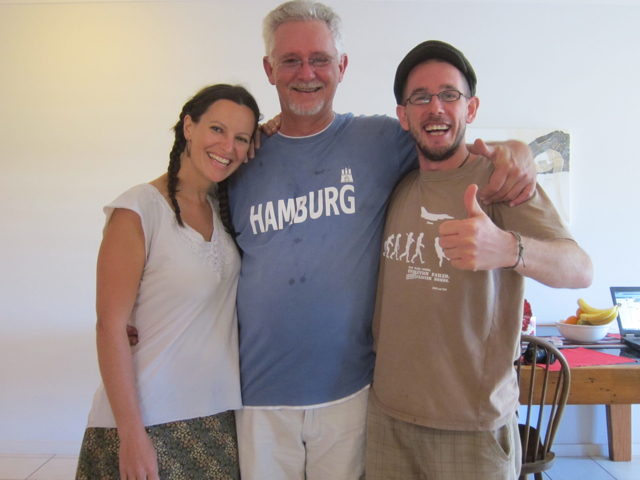 We totally love couchsurfing and can’t wait to host travellers ourselves! 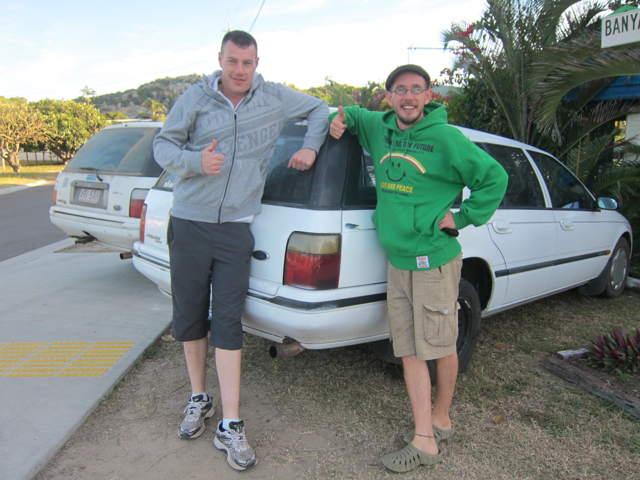 I’m still surprised at just how little time we had to wait in Australia before people pulled over to offer us a ride. It was no different leaving Townsville. I think 15 minutes, just enough time to eat a banana and take a quick leak, before Thomas pulled in. 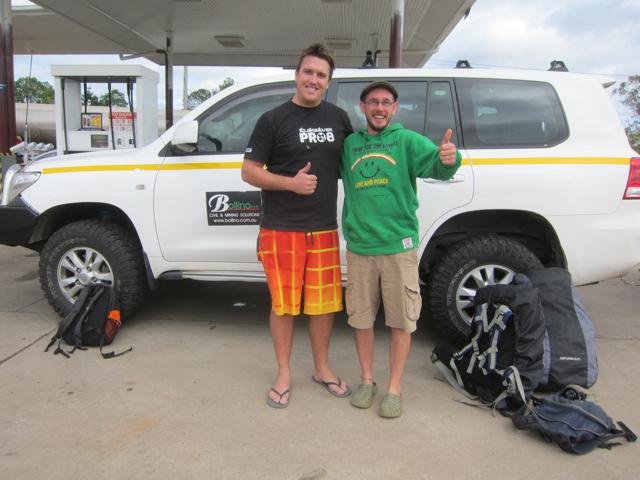 It was only 204km to Bowen where we were meeting our next couchsurf host, Jonno. Jonno had originally agreed to host us in Rockhampton but as he was in Bowen that evening he invited us to join him and a group of fruit picking hippies at a campsite for a gathering. Thomas decided to take us all the way there and join in the fun that evening, although I’m pretty sure he was more hopeful of scoring weed that meeting people! So we ended up sleeping with Jonno in Ginola’s tent after a communal meal, card games and a few late night drinks with mostly French and Italian fruit pickers. This is where the journey gets quite funny. 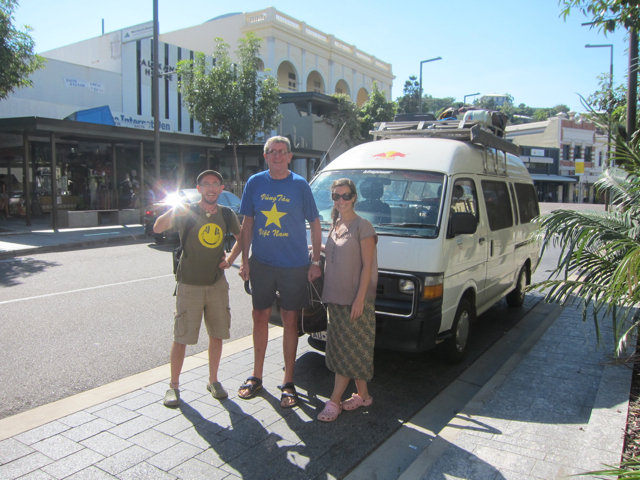 Whilst at Steve’s in Townsville we met Kevin who is Steve’s brother. Kevin offered to give us a ride the 717km south to Rockhampton when he returned home a couple of days later but we had already agreed to meet Jonno in Bowen. Jonno was returning to Rokhampton the following day so we would travel with him. Whilst with Jonno he changed his plans as an old girlfriend was in town and decided not to head back to Rocky. Nina and I called Kevin, knowing that he was coming our way in the morning and no sooner had we awoken, brushed our teeth and packed up our bedding, Kevin had arrived at the campsite fresh from a 5am departure from Townsville. We were really glad to see kevin and his granddaughter. 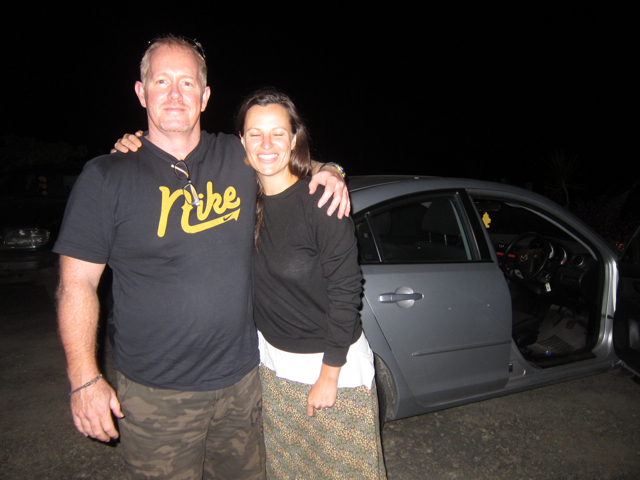 A couple of nights previous we had got to know each other whilst putting the world to rights and we were soon at it again chatting away in the car, only stopping for ice-cream on route, before being shown around the family home in Rockhampton! Who could belief that within three days we had stayed with and travelled with three brothers! Yes that’s what happened next. As we were coming into Rockhampton, Kevin’s brother Vince called to say he was in Rockhampton and would soon be heading down to Hervey Bay to meet “a friend with benefits”. Kevin immediately asked if he minded taking a couple of friends (which we were by now) the 400km south and Vince was happy to oblige, collecting us from Kevin’s house half an hour later. Vince liked to talk. And I must say we were very interested. He was nothing like Kevin, who was nothing like Steve, but he was interesting in his own way. We got to hear about his time as a prison warden, his motivational speeches as a soccer coast, his opinions on health cures such as hydro peroxide and mega doses of vitamin C before he embarrassingly disclosed his new “before bed habit” which had recently replaced reading. He made us try to guess and then told us he was addicted to a computer game on his phone where he had to build up a farm! 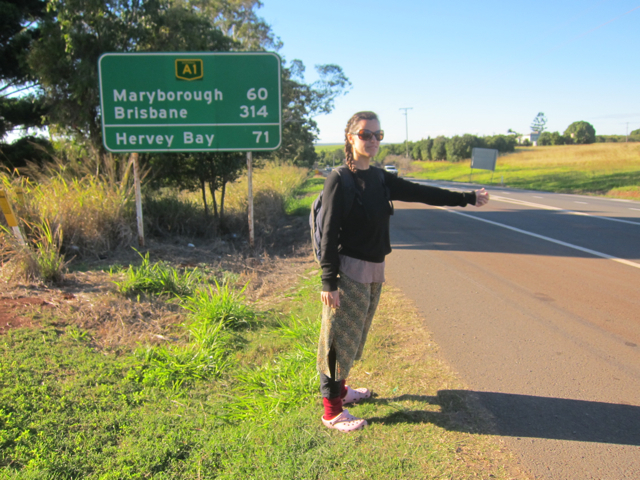 We arrived at the turn off to Hervey bay, now in Childers. Nina and I decided to jump out and try the campgrounds advertised for backpackers as it was now dark and starting to spit with rain a little, plus it was better for the next days chances of hitching, hoping that we would make it all the way to Dulong the following morning. We drudged into the campgrounds at Childers to find row upon row of dorm style accommodation full of “twenty something” fruit pickers eager to do their time in the country for an additional year on their visa. 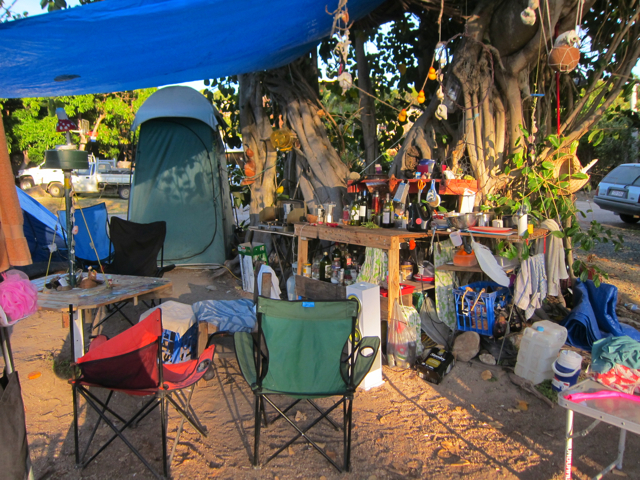 It was a sorry site, looking more like the campsite on the last day of Glastonbury Festival. We snuck into the communal kitchen to make a sandwich but there was nowhere clean to prepare it, just an Italian skinning up on the bench. We introduced ourselves to Alex and asked if people rent a bed or a dorm or what? He shot off to the next block and returned a couple of minutes later to say he had found us a bed even though the other boys in the room weren’t too happy about it. That’s when we met the boys from England, Jamie and Scott. 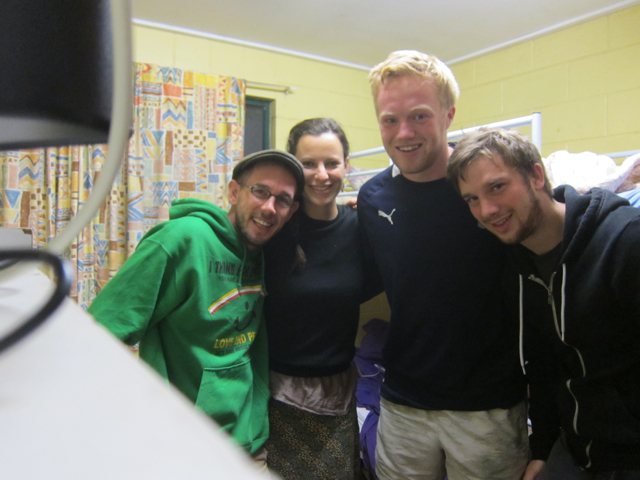 They were paying $173 a week for a dingy dorm bed and were wary of us kipping on their spare mattress for the night. We got chatting and were sharing stories of our trip, their fruit picking adventures and a meal before the night was over. We were up with them at 5am the next morning and as they left for work we made our way to the edge of town. From Childers we only had 218km to Nina’s family home in Dulong. It was ironic that we would stand waiting for the longest time in all our hitching days from England to Australia on the last leg of our journey. It was a fresh morning and we welcomed the sun on our backs as we stood for an hour grumbling at the locals who wouldn’t give us a second glance. Warwick to the rescue! As always – it’s only a matter of time. 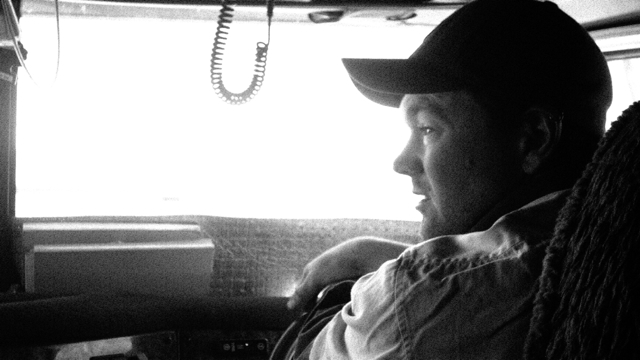 Warwick pulled over in his big 4×4, towing a boat on route to a fishing trip on Rainbow Island with friends. They’d been planning it for months and as we drove he received calls on his mobile from friends trying to think of excuses for the girlfriends to allow them fishing. We heard all the stories about how he had a reoccurring illness and time with his mates was the best cure. 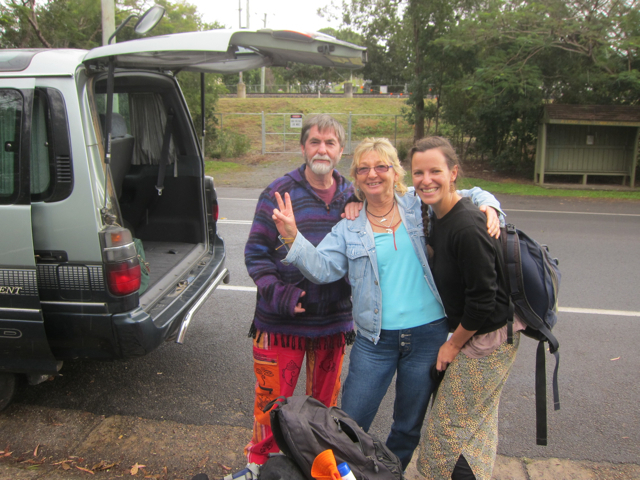 Warren treated us to a coffee and homemade peanut cake then dropped us at a petrol station in Gympie. We stepped out of the car and Nina popped in to use the ladies. As she did a man with a nepalese style hippy hoody emerged from the gents. I ran over to Warwick’s 4×4 as I thought I’d left the camera and as I walked back across the garage forecourt the hippy guy was chatting to a Nun in Tibetan buddhist attire. I only know one monastery in the area and it’s not too far from where Nina lives. They disappeared around the corner before Nina reappeared and when she did I said “quick there’s a Nun around the corner, maybe ask them if they’re going our way” and Nina shot off to catch them. Nina asked if we could grab a ride with them and if they were going to Chenrezig Monastery. They asked Nina how she knew where they were going. Nina looked at the Nun. They told us to hop in and off we went. The route to the Monastery took us to a turn off 8km from Nina’s family home and by this time Nina had been in touch with her Mum Christina who was super excited to see us and eager to collect us from somewhere. The Nun made us promise never to become a conservative and Harry dropped us at Palmwoods where we waited for Christina. As we hopped out of Harry’s people carrier Nina was starting to well up. We had been dropped off at the National Express bus stop by my parents 17 months ago in Thetford and it was quite fitting that Nina’s Mum would be there to collect us for the last leg of our trip. We felt so surreal. All those months of travel, all the memories, the people, the places and adventures and now we had arrived, stopped. 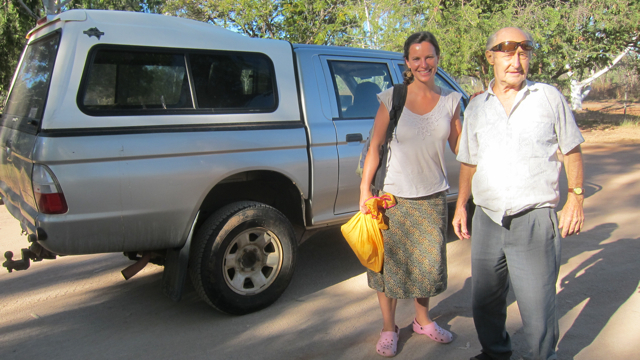 We waited for a while and Christina arrived for our final hitch to Dulong. It was an emotional reunion. Thank you too all the folk who picked us up. 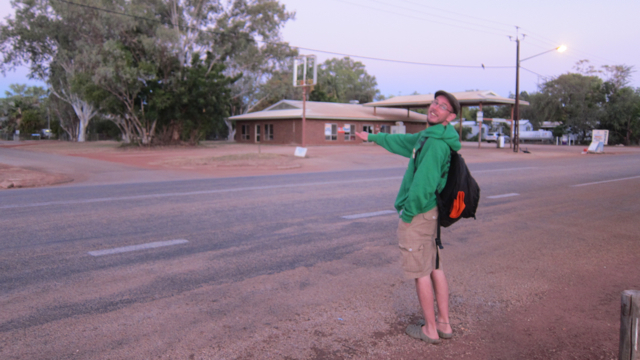 Hitch hiking across Australia ended up being one of the highlights of our whole trip. It’s a great way to meet real people going about their normal life. We didn’t have a bad experience and actually only had good ones. Yes hitching is about saving money. It’s also about saving carbon. Most importantly though it’s about connecting with people. Maybe it’s easier as a couple as people feel less threatened but I believe it’s easy if you are open. Every person that picked us up said that they do not usually pick up hitch hikers or that it’s the first time they picked up a hitch hiker and we feel hopeful that it won’t be the last. Since being home we have already collected hitchers and will continue to do so. 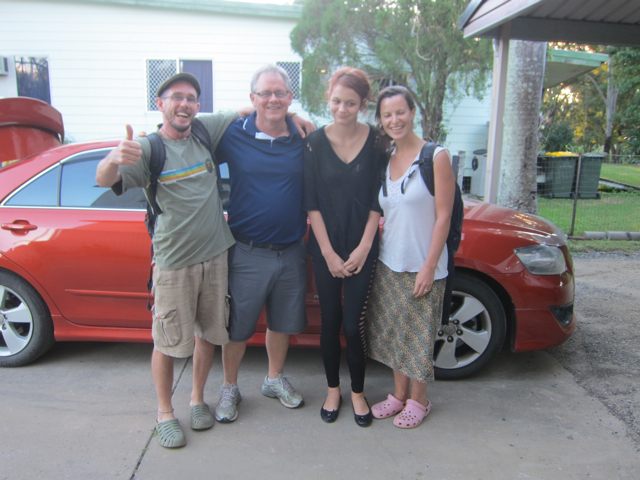 From a travel design perspective, hitchhiking, couchsurfing and the occasional bush sleep helped us to journey from Lombok in Indonesia, more than 5000km, over the course of 5 weeks, to Dulong in Queensland, for a total combined cost for accommodation and transport of $74. Who says budget travel is not possible in Australia? 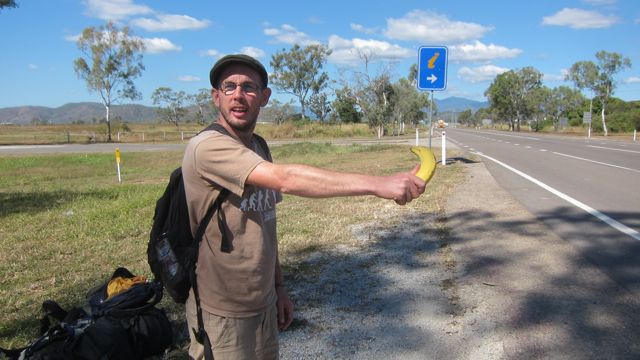 “You can’t hitchhike across the outback” the scaremongers said. 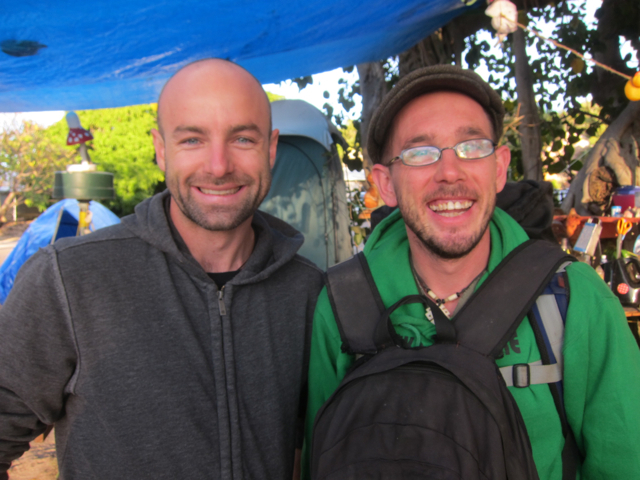 “Do you know how many backpackers go missing out there?” questioned the naysayers. “Why don’t you just fly”? we were asked my the conformists! Well i’m sorry folks but we obviously didn’t take any notice of the warnings and just happened to have had one of the most memorable and enriching stints of our whole journey from Caston, Norfolk, England to Dulong, Queensland, Australia. We rocked up at the BP petrol station in Darwin (A) about 11am last Monday. Nina had a quick pee while I guarded the bags. I noticed a chap walking towards the door and as I nipped in for the loo I said to Nina “just ask that guy if he’s heading south babe”. 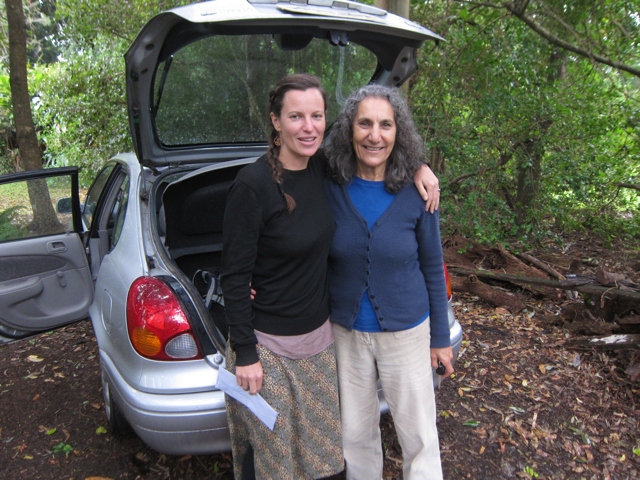 As I emerged a few minutes later I saw Nina through the window gesturing me to hurry – isn’t it great when a stranger offers to give you a ride without having to stick out your thumb at the road! Joe lived in an Aboriginal community. We spent five hours or so with him hearing about his early life at a prisoner of war camp in Yugoslavia, his views on the current political situation in the Northern Territory and the “holes” in Australia. The holes he’s referring to are the mines. “Dotted everywhere” he said. He even pulled in to Pine Creek, famous from the gold rush to give us a glimpse of an old mining town. 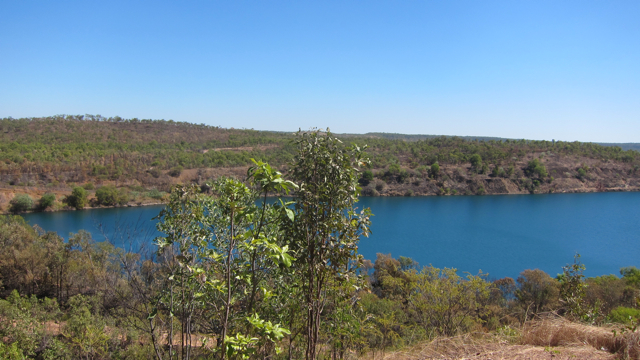 We stood up at the lookout and peered down into a lake 135m deep where a mountain of the same height used to sit. 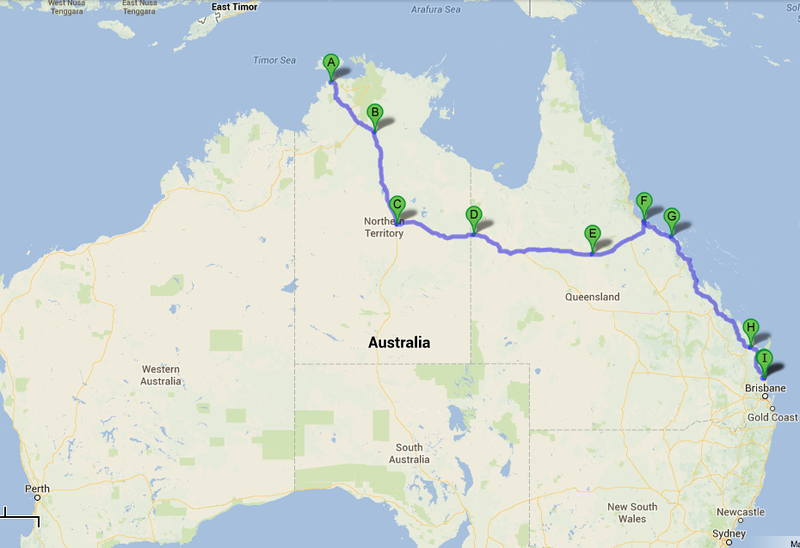 Joe dropped us in Mataranka (B), 422km south of Darwin. With only an hour or so of daylight left we decided to stay the night and walked into a camp ground. We’d sent our tent and sleeping bags home from Cambodia thinking we wouldn’t need them and so asked the staff if they had any spares but in the end laid out our ponchos for some kind of damp-proofing and squeezed ourselves into the one replacement bag we’d bought in Darwin. It was a cold cold night. We got a little sleep and were up with the sun to try for the hitch south. As we walked from the caravan park to the centre of the village we spotted a road train parked up for the night. Nina joked that it would be cool to ride in one as they look so invincible. This one was facing Darwin though and so we stuck out a thumb as the sun came up. A couple of minutes later a guy appeared from the truck eating a bowl of multicoloured cereal. I wandered over for a chat. 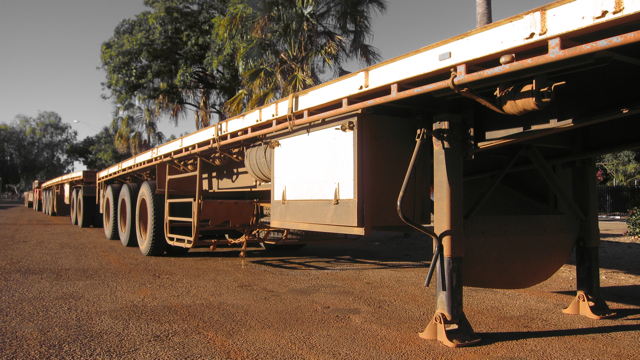 Aaron’s road train was 52 meters long and had a weight limit of 122 tonnes. The road trains travel a fairly constant 100 kmph and usually don’t break for kangaroo’s. Aaron had a fridge, freezer, microwave, fishing rod and a DVD player amongst other things but there was only one spare seat which meant Nina got to ride on the bed. Aaron was an Adelaide boy. A picture of his wife and daughter faced him from the sun visor. He sees them once a week if he is not away for longer. He was a nice guy working hard for his family. We travelled for 6 or 7 hours with Aaron, 542km south to the Three Ways Roadhouse (C), the turning point east for Queensland. I was amazed by the beauty of the scenery, the red soil, the termite cathedrals, the subtle changing flora. It was so alien to me and so interesting. The odd ute, truck or caravan passed us by but otherwise it was a very peaceful place. We arrived at Three Ways Roadhouse at about 15.30, keen to keep moving. We met Charles there on his way to Brisbane but he was jammed full. We walked around the corner onto the Barkley highway and out went the thumb in hope of a few more km before the day was out. Meeting Norman was a funny encounter. We were standing out at the Queensland junction having been picked up there once already only to tell the Singapore family who collected us that they were going the wrong way. They turned around and dropped us back where we came from. The next vehicle that came along was Norman. He was doing a u-turn right in front of us when I somehow managed to engage in a conversation through his window. “Which way to Queensland guys” he asked, looking fairly bemused. 20 minutes along the track he realised that he was doing a u-turn for a reason and whilst chatting with us along with his tiredness he had forgot to get fuel. So back we went to Three Ways for our third visit and a refuel, before turning east to Barkley Homestead as dusk drifted in. It was dark by the time we arrived at Barkley. Easy to sneak in, lay down some cardboard and pull over the sleeping bag, helped greatly by the friendly irish trio who leant us a tarp for damp-proofing. We were up again before the sun and waiting out front for the early hitch, hoping to catch those people trying for the longest daily distance with the brightest start to the day. 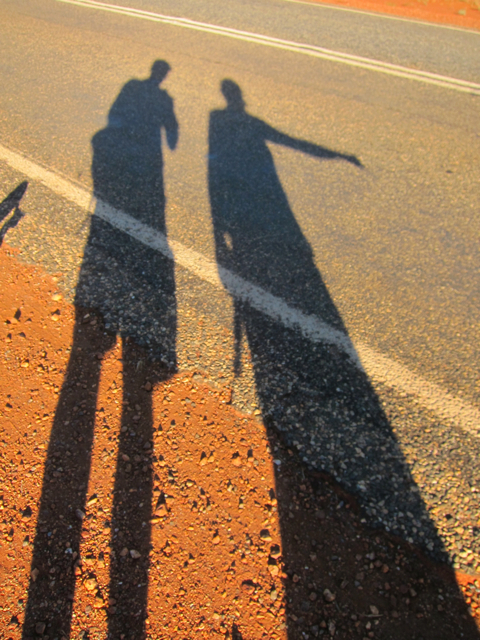 We chatting with another road train guy who was not keen on taking us. There was also the cycle crew doing a 15000km tour of Oz. Obviously no room there. Just as the sun appeared on the horizon, Norman appeared from the camp grounds. He drove straight over to where Nina and I were standing and said “just gotta get some fuel guys and I’ll pick you up.” He did his famous u-turn and returned a few minutes later looking somewhat perkier than the previous evening. As we set off towards Queensland we felt like old friends, safe in the knowledge that we would push a long way east with Norm that day. 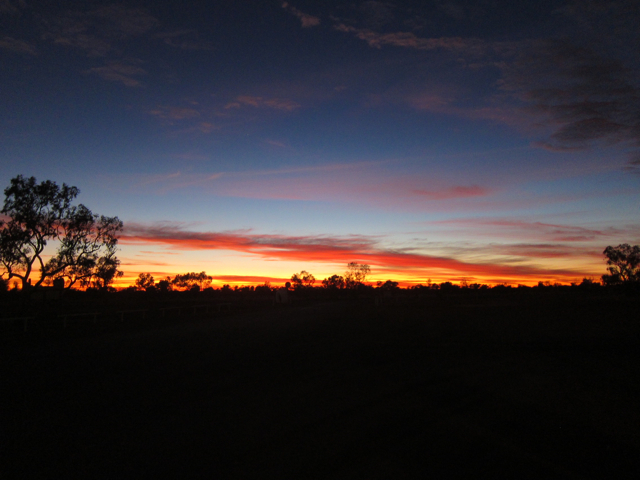 After another night under the stars, this time in Hughenden (E), a flat tyre and a couple of stops in old outback towns, Norman dropped us in Townsville before he headed up to Cairns. We had spent three great days together, chatted our way across 1540km of Australia, exchanged books and emails and finally arrived on the east coast of Queensland!